Krakens are gargantuan leviathans of the deep, intelligent and predatory. 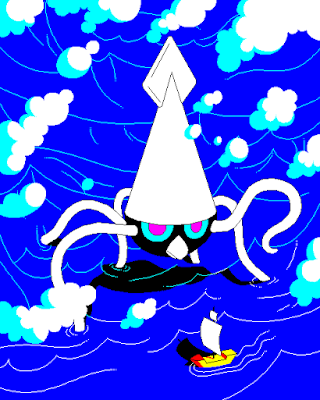 Mostly seen by sailors (and even then rarely) these squid-like creatures devour ships whole or drag them beneath the waves as prisoners to their underground cave-lairs, where they keep slaves to serve and feed them. Pixelly stuff again this week, sorry if you prefer the more brushy sort of drawing. Also why am I so fond of hi-contrast colours? I guess it satisfies my inner purist. These colours make for such nice, simple hexadecimal values! #000000, #FF00FF, #0000FF, I could go on.